We have three eclipses in a row this eclipse season, they happen not so often, usually its one lunar and one solar, twice a year, this year it’s five eclipses. spirit and matter, as above as below. 12th /13th July Cancer New Moon Partial Solar Eclipse. with a Blood Moon and will be the longest total lunar eclipse of the 21st century. 11th August, Leo New Moon Partial Solar Eclipse. so Mother Earth and all of us will really be feeling the pull. A huge shift for all of us in the One Heart!!! The New Earth Grid works with the liquid light plasma and the Diamond Light Matrix and has new access points, as has already been discovered at some places worldwide already, at the Azores, Flinders Ranges and Arkaroola South Australia and many more that we have worked at over the years now linked as the flow allows us to start moving around and through the planet with more ease. Many have used the serpent tunnels and songlines to travel through and around the earth, now becoming more accessible as we raise our frequency. Be aware of when you travel somewhere that you flow along the liquid light plasmic field, and you are already there. There is endless time and so you don’t need to look at your watch or clock to make sure you will be on time. You get there in divine flow and it all unfolds beautifully and with grace. We are now exhilarating so fast we are being railroaded in everything we do. That means no time to think, it happens in the now, with ease, grace and universal flow. We are opening up to whole new way of Being and operating, as well as a new body. After all the dark night of the body/soul experiences we have been through especially in the last six month since the September Equinox 2017 to the March Equinox 2018. We have been given opportunities like never before to be sovereign, clear, open, awake, at peace, whole and healed. The intensification of all experience good, bad, neutral is forcing us to be more aware, vigilant, on to it and able to really love our self and all others unconditionally. I know some of you have been through major body imbalances, to some of you only some slight discomfort with the subatomic changes going on. Carbon to Crystal to Diamond. Now with the amazing shifts at this March Equinox just gone, we are able to embody our multi-d, higher vibrational self to full integration as we move from the old grid of our self to the new grid of our self and the higher dimensional Earth. Now since the March Equinox and the New Earth Grid anchored, also meaning our new grid anchored, as we are not separate from our Mother Earth, all the breathing, unification, clearing that has unfolded in divine love and oneness has created our physical body and energy bodies to become so Light, transparent, we too are the Stargate within and without. As the New Earth Grids awakening through our love and the crystal skulls, our higher dimensional aspects we are clear, healed and so much more aware and conscious. TO INTEGRATE EARTH AND STAR WITHIN AND WITHOUT. Powerful events will unfold this year that have not been able to before because humanity was not ready. Now with the Unified Light Matrix firmly anchored through us and the Greater, Greater, Greater, Greater, Greater Central Suns, the New Creation Matrix, the new DNA codes for the Galactic Hu-Being. We are here to explore what some may say are unexplored waters, but they are very familiar to us and our home in the Cosmic Oceans of our inner worlds and outer realities. I have felt since 2014 at the Stargate openings that 2018 is going to be amazing cosmically. That we can, or the first wave will biologically transfigure fully into the New Earth. For some of us we live in transition now as it is, and our lives are blessed, abundant, peaceful, experiencing joy and full of love for self, all others and all creation. The next step, ‘through the eye of the needle’ me merge spirit and matter. As we love and accept our fears and limitations we fully embody our Light self. We choose love and not fear and so embody our Multi-Dimensional self. as our Mother Earth makes us listen and change how we think and live. Time to fully co-operate with each other for the benefit of nature and the environment, for those less fortunate and suffering. Enough of the old paradigm feared based systems of control greed and terror. We will stand together to stop this as the collective conscious is shifting. At present 45% of humanity wants to change to a loving, peaceful, abundant for all, healthy Earth. By the end of 2018 65% will want to say, no more. We can do it!!! it will be the year where all the service work; bigger and smaller picture will be so obvious for all to see. We break free to be our highest potential. Are you having weird stuff happening to you right now, or maybe it’s just finished or finishing, like the shift has already occurred? With the eclipse energies and all the other planetary and cosmic alignments we are moving Worlds. So anything that is even slightly out of balance within you, or any fear no matter how loved but still a teeny bit there unnoticed. It’s all in our face in strange ways. Because it’s being thrown at us from whatever hologram of illusion. As all our other selves’ physical and non-form, multi-dimensional, other worldly are all merging now. So as our time lines merge it’s just these filaments of unresolved energy coming at us in weird ways, from people and situations. I have had my fare dose of weird stuff in the last month or so, and each thing could have been a big deal and disastrous but it wasn’t, it was just noted as weird and not quiet understood. Knowing it wasn’t unresolved dark aspects in me, or karmic, or being attacked by dark forces even though it could come across like that and that’s only fear anyway. It’s just us completing. I must admit to being perplexed about some of the crazy things that had happened to me recently, but like I said no charge of energy there and all with amazing silver linings, surrender and allow. We are also letting go of everything so if you feel jaded about certain things, or tired of the whole game then you have got your money’s worth and ready to move on into a lighter, brighter, loving peaceful Earth. We are at transition time, all the illusions of our dance in duality, holograms we created to experience the furthest extremes of our love. Now loved back into wholeness and oneness and the times lines of our journeys are merging. For those who are aware and in a state of unity consciousness the majority of the time; just little filaments flying through you to be acknowledged, let go and recognised as the last bits of completion. As we bring all our fragments into wholeness and oneness. The worlds are merging, all our other selves are coming to meet us. For those that are awake this is awesome and a completion, as we vibrate in higher dimensions of creation that we are always one with, but now remember and Be fully in our physical body’s. To those more asleep; a quickening like no other before, wake up Now. As the union takes place it feels loving, but brings up the fears fast. This could be overwhelming so be aware to hold the BeAm of divine love and oneness through all worlds and dimensions to assist others to find the peace and surrender to their true selves. Everyone is feeling the shift, honour yourself as much as you can in these special days with being in nature, relaxing more, having fun, being still, time out, chill out to allow. Remember it is only illusion, don’t put any energy into it, and just take the steps you need to. In order to resolve it into a loving, peaceful, situation without any emotional or mental charge, being at peace within. Connect and go deeper into your heart centre, know you are one with the Source through all worlds and dimensions and time and space. Aware of all your Multi-d Selves merging through your central channel, all One Body of Light, right through your physical body. Surrendered into divine will and plan. Knowing that whatever comes at you is part of the fear world, no longer where you resonate, deep breathe love and acceptance into any fear no matter how subtle that might still be. Until you don’t think about what’s happened to try and throw you off your centre. You are your centre, in the peace, the stillness and the love. Know you are beyond the illusion, not of it. Your world is of love, peace, harmony with all beings and creation. We hold the BeAm of Heaven and Earth merged within us and step through the doorway of our heart to our unlimited self. Please see the Mp3s, books and mandalas if you are having a bit of a tricky time right now. Recommended especially ‘Out of the Loop’ with Cosmic Time Clock’ mandala aligning all your bodies through you 3d body and surrendered into the universal flow. Being your Multi-D self, activating your Light Body. See the page of free links to a lot more as well. The extracts from my books and all my books. As well as the two radio shows with powerful activations and inner healing . The latest Earth Star Essences, Evenstar Essences and Light Body and Chakra activation DVD. This has not happened before; but then the Starlines will move out through the hyper-dimensional doorway of Mead Wall on Mt Ruapehu and back through the hyper dimensions and multiverses which it can do from that doorway. This means that Earth is centred, stabilized and aligning more with the unified Matrix of Light. This Solstice doorway means that with the Starlines anchored through the Earth and back out again, that a circuit has been created though not just our smaller cycles, but the grander cycles. Creating balance and harmony. This environment means that those on and off planet beings with agendas that are not in alignment with divine love, peace and abundance for all have an environment that no longer supports them. You might wonder where do the Starlines come from and go back to, as they link us up in the unified field more fully? There coming and returning to of course the Source, so there is really no coming or returning, it all just is. But in the creation fields that we exist in, the link is through the Greater Greater Greater Greater… Central Sun. We have been experiencing really big shifts lately with Diamond Light Matrix now fully through us at the Wesak Full Moon. The Golden Solar Discs aligning May 28th, then on May 31st myself and a friend discovered a subtle universe of reptilian sabotage that was multiverse and was sorted. Then the first incoming soul that has no distortions of duality was able to be conceived here on Earth, which is huge. As the one cell of purity that this soul holds is now able to be embraced by those who choose. our love Heaven on Earth. Thank you. THE DIAMONDS DISSOLVE INTO US!!!!! A few weeks ago I was blessed to meet a beautiful new friend, Shelley Lemaire who has moved into my area and she has been working with the incoming souls for 20 plus years. In early May after years of preparation and the resolution of duality within the body, the incomings are birthing into a body of universal unity, purity and coherency. After comparing notes Shelley and I realised a lot of what we have both been doing in our missions has run concurrent and that my focus and mission as well as so many other Unity Workers has been to create the foundations and energetic environment so that this divine birthing could and can take place now with these amazing souls that are our future. So much gratitude to them, all those involved and to Shelley for facilitating the birthing. Coming out of the cocoon with the Taurus New Moon and by the Wesak Full Moon our new Lighter bodies that are already in the New Earth, higher dimensional Earth are more integrated with our higher dimensional selves . We are the stillness, the peace and void and create from the stillness where all is manifest. We are the BE AM, the Stargate . I am sure you notice things going on with your body; the ringing in the ears, the weird energy shifts and manifestations in the body at times. Your body may also be a bit slower than usual, or doing things is slower if it’s in the third dimensional, days just whizz by. either way be in the stillness and peace, allow and surrender to this beautiful awakening to our selves. The old is breaking down, our ego is breaking down, you might observe the systems we have been under that are controlled by fear or greed are breaking down. Duality is not being supported anymore. We have been in a Light Ship being healed, rearranging our molecules, in the unified light matrix. The Light Ship is us and we have cocooned our selves to now open up as the beautiful butterfly. I even had them in the physical under my bedroom window. This New Moon in Taurus solidified the denser aspects into the new light matrix as we come into the centre and a state of peace. I experienced that in the middle of cyclone Cook, just after the floods of cyclone Debbie; the wind was full blast where I live. Holding the BeAm in the centre of the storm, the elementals so kind, as it wasn’t possible to move the storm, all for a reason of course, for us humans to learn and grow by. But all my roses, flowers, baby trees and even the huge tall trees that swayed back and forwards violently, were like no storm had been when I checked them all the next morning. Now we are out of our own personal storms for some of you so subtle, last tiny filaments to be embraced in love, for some of us physical ailments or weird stuff, I know I have had mine, all bigger picture and not even my stuff, but we agree as unifiers. Holding that beam always, in the centre of whatever, we are blossoming to do this. On the Wesak Full Moon in two weeks the Shambala planes of our existence and experience are opening up the opportunity for us to review our contracts , missions and ways of service. As we shift into a higher state of resonance and Being, a lot of this old way of operating is falling away. I know a lot of us have been in a cocoon since January 17 when we had an inner planes link up; the power of love shifts us out of the old paradigm world, in love we unite, read more . Now just after the Taurus New Moon 26, 27 April we have gone so much deeper within to hold the stillness and peace. By the Wesak Full Moon a rejoicing of the unified field, the higher dimensional Earth and love and compassion so tangible. Linked in our souls, we are already one with everyone. As we be the stillness and peace. See more on the Wesak Full Moon in Cosmic Events. all credit is given to the author and it is freely distributed. 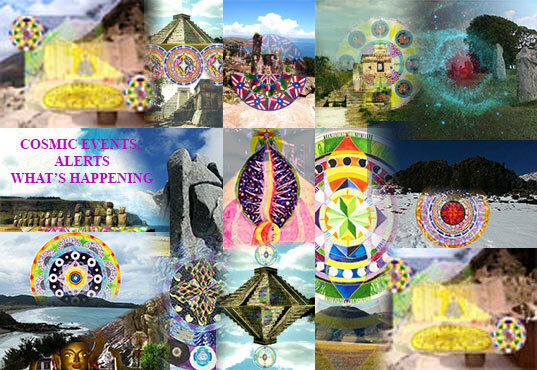 THE FIVE STARGATES, OVERVIEW AND PARTICIPANTS EXPERIENCES. linking in the One Heart and on the particular focus of each link up. but it’s awakened in our DNA cellular memory, expanded, aligned, at peace. We are now able to go deeper into our cellular and Multi-D selves to love and transmute any imbalances still held in the illusion, the matrix, the synthetic universe so we can fully Be our multi-dimensional selves as they all merge though our clear physical body. we are our Body of Light right here, right now. We create the higher dimensional - New Earth from our higher dimensional selves right through our physical bodies and physical Earth as we all open to our true divine selves. THE THIRD STARGATE OPENING AT EAST GIPPSLAND AUSTRALIA. AND STARS NOW ILLUMINATE US. THE CLEANSE AND NEW LIFE, THE VEIL BREAKS OPEN, PEACE. to assit yourself, humanity and the Earth in the great shift. BEING IN THE UNIVERSAL FLOW, GROUNDED AND OPEN TO THE NEW LIGHT CODES.